I am not a parent and will never be one. But I was once a child and I spent my career among young people. I think Ten Ways to Destroy the Imagination of Your Child by Anthony Esolen may be a very good book for parents of young children and for those who will be. 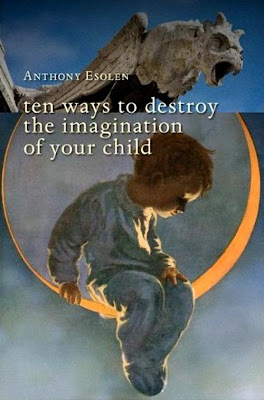 Much like The Wonder of Boys and The Wonder of Girls, and The Dangerous Book for Boys and The Daring Book for Girls, Ten Ways to Destroy the Imagination of Your Child confronts contemporary trends in parenting and schooling by reclaiming lost traditions. This practical, insightful book is essential reading for any parent who cares about the paltry thing that childhood has become.